Plus, play like David Gilmour, learn to play Foo Fighters and more! Total Guitar issue 262 is available in print and worldwide digitally for iOS and Android now! This month, we want to help you improve your rhythm guitar playing. 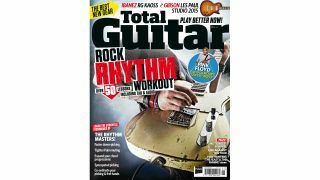 From picking to palm muting, chord voicings to developing timing, our 20-page Rock Rhythm Workout will turn you into a rhythm guitar machine, with over 50 audio examples to accompany the tab exercises in your your mag. Traverse the neck with ease thanks to our bootcamp! Blag Surf Rock in 10 minutes! The Kaoss Pad-equipped guitar for £300!